Rapper, Legacy, stops by Vigilantes Radio's "Inside The Music" Series, to chat with Dini about artists being 'teachers in disguise', his opinions on who are the giants in the music industry right now, & ... Maggiori informazioni finding out how he plans to make a difference; not only in music but in the lives of others as well. To find out, set your reminders, it's happening! 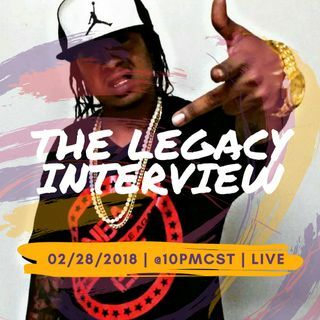 02/28/2018 | @10PMCST | Call in at 701-801-9813 | You can also hop in the mix by visiting www.onlyonemediagroup.com and slapping that "Go Live" button | Please follow our show at www.spreaker.com/onlyonemediagroup & remember sharing is caring! Thanks for your continuous support!